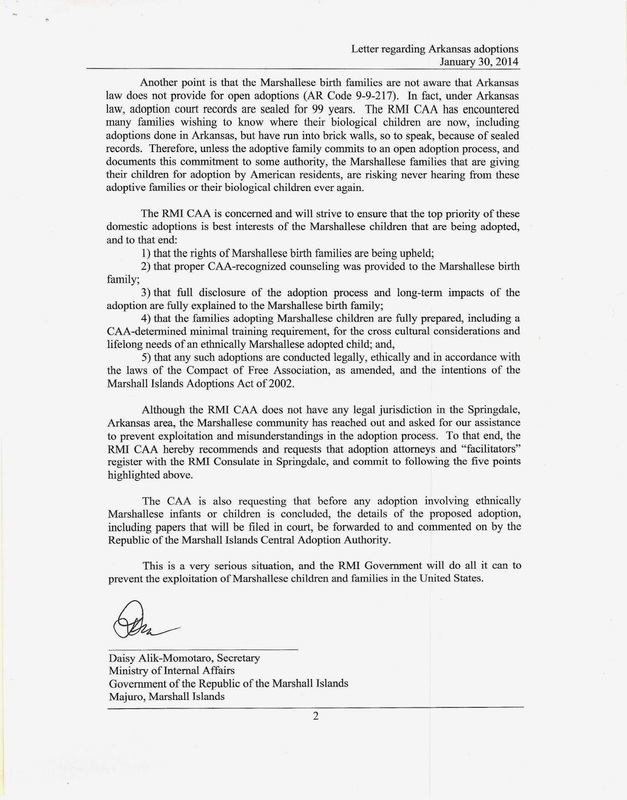 The letter below was just released by the RMI Ministry of the Interior and pertains to the adoption of ethnically Marshallese children by US families through US domestic adoption. If you are pursuing an adoption like this, PLEASE do as the letter requests. I know how hard it can be to have what seems to be more stumbling blocks thrown in the path to building your family but taking these extra steps will protect the child, the birth family, and you. According to the RMI Adoption Act (Bill 92 N.D.2, P.L.2002-64), it is illegal to solicit a family in order to pursue an adoption with them and according to the Compact of Free Association it is illegal to travel to the US pursuant to an adoption. Given the close relationship between the U.S. and the Marshall Islands and the history of adoption abuse in the Marshalls, it wouldn't surprise me if those in a position to do so decided to make an example of someone who didn't follow through with their request. Thank you for taking the time to provide this information it was very helpful. I am incredibly grateful that my son's adoption is fully open and that we have a healthy relationship with his birthfamily in Arkansas. It is truly the best gift I can give him. We love open adoption! All our adoptions are open and we treasure our relationships with our children's birth families. Does anyone know a legit agency to go through for this? Sorry for the delayed response, Angela, I just saw your comment now. 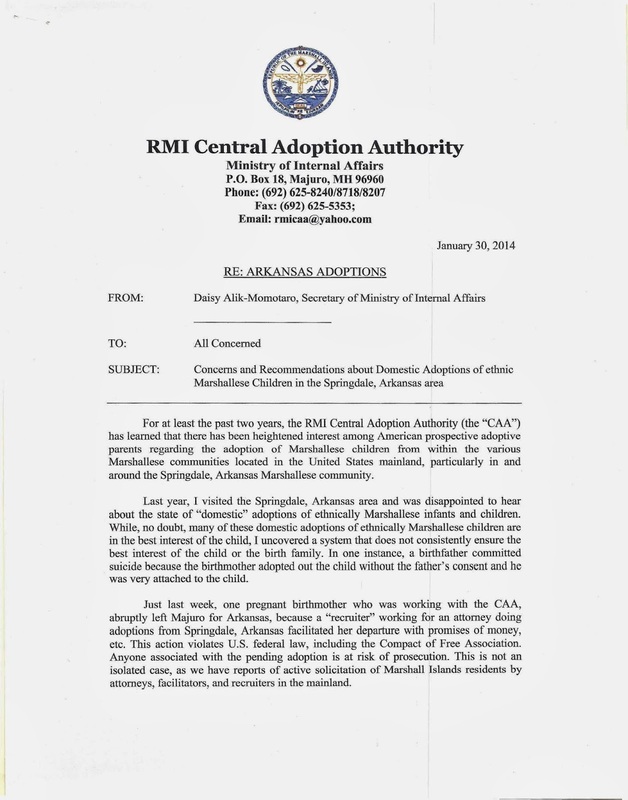 To the best of my knowledge, all the adoptions that happen in the RMI community in Arkansas are technically private adoptions, handled through lawyers. Lutheran Social Services of Minnesota and Adopt International are the two agencies licensed to handle international adoptions to the US from the Marshall Islands. So is it ethically ok to adopt a Marshallese child from Arkansas through a private attorney out there? Does it just depend on the situation and lawyer?